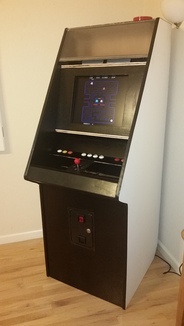 My goal is to build MAME cabinets powered by a Raspberry Pi that in addition to playing arcade games will play old retro console and home computer games. I’m targeting 8-bit machines so the Raspberry Pi has plenty of CPU power to emulate things like the Atari 2600, Atari 800 and Apple II. I’m (mostly) done with the upright cabinet! 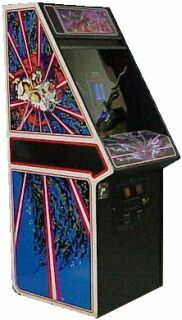 The cabinet design I liked best is Tempest. 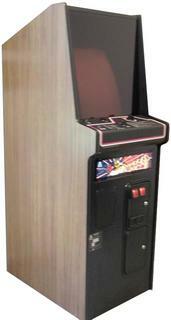 I’m completely terrible at the game, but the angular cabinet design stood out to me as such a classic. The biggest design requirement is modular control panels, similar to Doc’s Modular MAME in that I want to be able to play a lot of different types games using different control layouts without resorting to the frankenpanel look. My plan is build two MAME cabinets: a full size cabinet with a horizontal monitor and a cabaret with a vertical monitor. For a cabaret, the Atari cabarets all seem to be the same, so while it doesn’t really matter which game’s cab I use, I grabbed the Tempest one for consistency. I found Google Sketchup designs for both and modified them to fit my ideas. The modular panels can be shared between both cabs, so the control panel dimensions have the same depth. The difference is the width: the full-size cab has a 24” wide panel, while the cabaret has an 18” wide panel. 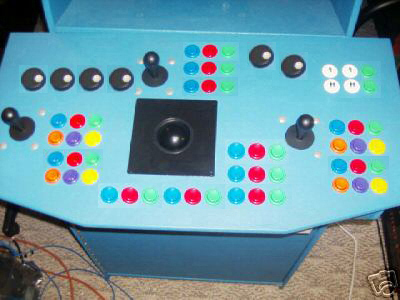 The full- size cab is wide enough to be used for simultaneous two-player games, while the 18” wide panel of the cabaret is limits its use to one player at a time. © Copyright 2014, Licensed under the CC A-SA 4.0 Intl. Last updated on Dec 25 2017. Created using Sphinx 1.6.3.